It's sad to see this popular Glasgow football pub is now demolished. This old pub can be traced back to 1874 when landlord Andrew Bishop was licence holder. Andrew was born in Glasgow in 1832 and lived in Firhill Road with his wife and family, he served the locals here until he sold the business to Peter Monachan in 1894. Mr Monachan traded here into the 1930s then Robert Lang took over the pub. Left to right S O'Leary, Park Lane Tavern, Angus MacDonald, Firhill Tavern, D Gilroy, the Viking and J McDevitt, the Killearn Bar. Taken at the Glasgow Licensed Trade dinner dance are Mr J Boyle (Drybroughs); Mr & Mrs S MacDonald (Firhill Tavern); Mr W Martin (Calypos); Mrs and Mr L Kavanagh (Drybroughs). 1971. Thanks to Alex for his email dated 12/07/09. 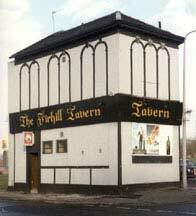 I came across the site today and would like to add a wee bit to the history of the Firhill Tavern which you may wish to include. I lived opposite the Firhill Tavern in the 50s and as a child often heard of it referred to as Langs. In the 1990s I became friendly with Robert Cameron who worked in the bar in the 50s and it was his cousin Bob Lang who owned the place .Sadly Robert passed away earlier this year aged 92. He knew members of my mothers family, The GRIEVES, and the men, George, Bunny, Arthur and John all liked a dram in the bar. 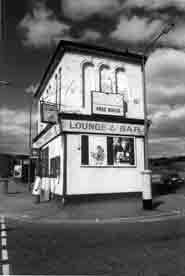 My late father ALEX OBRIEN worked in the bar part time in the 60s/70s when it was owned by a Mr Colville. It then was owned by Angus McDonald and Tommy was the chargehand . The picture of Angus brought back memories as I recall him as a really nice guy who liked a dram. My dad often took him home in his car to the Southside. The Firhill Tavern was a friendly wee pub with a good set of regulars .I don't think I ever had a beer in it.My dad saw to that! 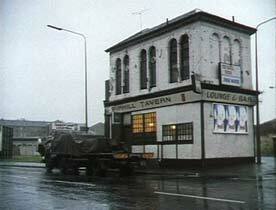 The Firhill Tavern featured in an episode of Taggart in Murder in Season from 1985. The following are film clips from that episode. Thanks to Stina Wirfelt who is working on a project on the various settings from Taggart.